The South Texas Brass Symposium was created in an effort to promote the performance, education and awareness of brass music in the South Texas region. Bringing world-class musicians and the area’s best professionals together at Del Mar College for masterclasses and performances will create unique learning opportunities for students, musicians and the general public. Please join us as we celebrate a rich and exciting repertoire of music for brass instruments. Description: The organizing committee of the South Texas Brass Symposium is seeking original, unpublished works for a trio (trumpet, trombone, and piano) to feature in a recital performance by Del Mar College faculty during the annual South Texas Brass Symposium on March 1-2, 2019. The winning composition will receive an opportunity for a premiere performance at the symposium and a live recording of the work. Instrumentation: Must be specifically scored for B-flat Trumpet, Tenor Trombone and Piano. Composition Guidelines: We are looking for a piece of music of medium length, between 5-10 minutes, of musical worth and substance that will be attractive to audiences and performers alike. The work should be listenable, appeal to general audiences and be written in traditional notation for the specified instruments listed above. The piece should be original and unpublished, although it may have been previously performed. All submissions will be judged anonymously with a third-party organizing the materials. Please make sure your name and contact information is included with your submission. Recording in mp3 format (live recording or MIDI generated recording is acceptable). Please send as an attachment or direct download link. MIDI files will not be accepted; applicants must convert MIDI to mp3. Applicant contact information and title of composition in email body. The winning submission will be notified by January 1st, 2019. Attendance at the Symposium is not required, but highly encouraged. Any questions or concerns can be directed to Dr. Pinson at the contact information above. On Saturday, March 2, we will have an exhibitor room available from 10am to 5pm in the Jazz Rehearsal Hall, Room 153. Be sure to check them out! Locally owned and operated in Corpus Christi since 1973, we specialize in school band instruments and also carry a wide variety of instruments for the professional musician. We have a staff of experienced musicians and former band directors to answer any question you may have. Our inventory includes major brand names such as Selmer, Bach, Conn, King, Armstrong, Gemeinhardt, Yamaha, Takamine, Pearl and many others. We visit schools on a weekly basis to provide products, repairs, and advice your students and band directors may require. Music Mart will have a Jupiter display setup this year. Stop by their booth and give their instruments a try! The brothers from Phi Mu Alpha Sinfonia, Kappa Chi chapter will have a snack booth setup near the exhibitor room where you can purchase food and drinks. So stop by for a refreshment or just to say hello and talk about Del Mar College. Registration will be available on site, and is $10 for all events. Del Mar College students, faculty, and staff get in free with a valid college ID. The South Texas Brass Symposium will be held in the Fine Arts: Music building on the East Campus of Del Mar College. Parking around the music building is free and available on a first-come, first-serve basis. Bass Trombonist Douglas Yeo was born in Monterey, California and grew up in Queens and Valley Stream, New York. 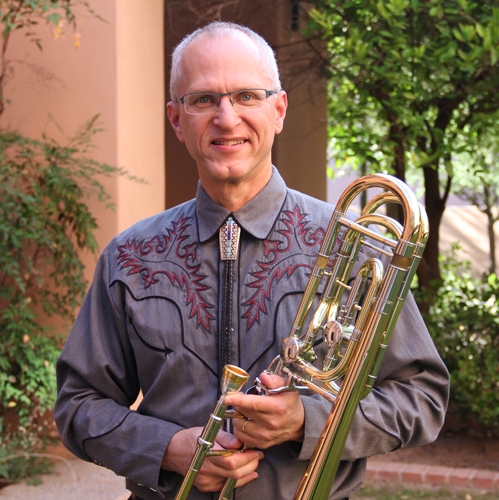 From 2012-2016, he was Professor of Trombone at Arizona State University, a position he assumed after a 27 year career as Bass Trombonist of the Boston Symphony Orchestra/Boston Pops Orchestra. Upon his retirement from ASU, he was given the title of Distinguished Adjunct Professor of Trombone. While in Boston, Professor Yeo was on the faculty of New England Conservatory of Music. Before coming to Boston in May, 1985, Yeo was a member of the Baltimore Symphony Orchestra from 1981-1985 and he was on the faculties of the Peabody Conservatory of Music in Baltimore and the Catholic University of America in Washington, D.C. A prolific writer, Mr. Yeo has written more than forty articles on the trombone and orchestral playing for the Galpin Society Journal, International Musician, The Instrumentalist, The Brass Herald, Christianity Today, the Historic Brass Society Journal, the International Trombone Association Journal, the T.U.B.A. Journal, the International Trumpet Guild Journal, The Horn Call, the Newsletter of the Christian Instrumentalist and Directors Association (CIDA), The Real Issue, Transpositions and the Boston Symphony program book. He is the author of “The One Hundred: Essential Works for the Symphonic Bass Trombonist,” the most comprehensive book in print on the subject of bass trombone audition and concert preparation. He is also the co-author, along with Edward Kleinhammer, of “Mastering the Trombone” published by Ensemble Publications. His arrangements of music for trombone and piano, trombone ensemble and brass ensemble, and trombone duet are published by International Music, Southern Music, Ensemble Publications and G. Schirmer. In recognition of his "distinguished career and in acknowledgement of his impact on the world of trombone performance," Douglas Yeo was awarded the International Trombone Association's 2014 ITA Award. In addition to playing the bass trombone, he plays bass trumpet, contrabass trombone, serpent and ophicleide when called for in the orchestra. In 2006, the New England Brass Band, under Mr. Yeo's direction, won first place in the Honors Section at the North American Brass Band Association (NABBA) Championship held in Louisville, Kentucky, building on their 2004 Championship win of the Challenge Section in Charleston, West Virginia. An international YAMAHA Performing Artist, Douglas Yeo has collaborated with YAMAHA to produce the bass trombone (YAMAHA YBL-822) and mouthpiece (YAMAHA Douglas Yeo Signature Series Bass Trombone Mouthpiece) that he currently plays. He holds a bachelor of music degree with honor from Wheaton College in Illinois and a Master of Arts degree from New York University. His principal teachers were Edward Kleinhammer and Keith Brown. 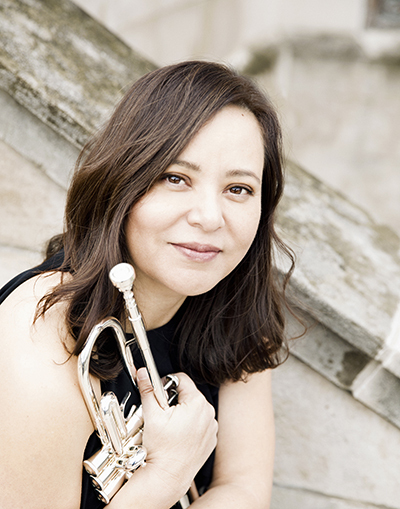 Raquel Rodriquez Samayoa is the Assistant Professor of Trumpet at the University of North Texas. Prior to joining the faculty at UNT, Dr. Samayoa taught at Tennessee Tech University and Northern Kentucky University. Dr. Samayoa maintains a versatile career as a performing artist, clinician, educator, and scholar. She has performed throughout Russia, Finland, Australia, China, the United Kingdom, Mexico, and the United States. Raquel is a member of Seraph Brass, a brass quintet comprised of top female brass players in North America. The group performs frequently around the country and abroad. The group was recently featured at the 2018 Lieksa Brass Week in Lieksa, Finland and will be featured artists at the 2019 International Trumpet Guild Conference in Miami, Fl. An active clinician, Raquel has given recitals and master classes at numerous institutions worldwide and has presented clinics at the College Music Society Southern Conference, Midwest Clinic, Historic Brass Society Symposium, the International Trumpet Guild Conference, and the TMEA (TX), OMEA (OH), KMEA (KY), and GMEA conferences. Raquel was recently a guest artist at the Brass Day of the Moscow Conservatory (RUS), Brass Day of the Melbourne Conservatorium (AU), University of West Georgia, Berry College (GA), Virginia Tech University, TAMU-Corpus Christi, Michigan State University, Luther College, University of Kentucky, and the University of North Carolina-Pembroke. Raquel’s scholarly activities have resulted in articles published in The Instrumentalist and International Trumpet Guild Journal. As an orchestral trumpeter, Raquel was recently principal trumpet of the Bryan Symphony Orchestra (TN) and a former member of the Kentucky Symphony Orchestra. In the summer months, Raquel performs with the Artosphere Festival Orchestra (AR). She currently performs with many regional orchestras in the DFW area including the Plano Symphony Orchestra, Irving Symphony Orchestra, among others. Raquel has been a prizewinner at the International Women’s Brass Conference, National Trumpet Competition, and at brass band competitions in North America: NABBA and the US Open Brass Band Competition. Raquel has performed as soloist with the Bryan Symphony Orchestra (TN), Topeka Symphony Orchestra (KS), the UNT Symphony Orchestra and Chamber Orchestra, the Tennessee Tech Symphony Band, the Fillmore Wind Band, Frank Simon Band, Lexington Brass Band, Athena Brass Band, Fountain City Brass Band, and the Southern Stars Symphonic Brass Band (TN). In 2013, Raquel recorded “Cincinnati Virtuosity – The Cornet Solos of Frank Simon and Herman Bellstedt” which is available on Amazon and iTunes. Dr. Samayoa is a clinician for the Conn-Selmer and Denis Wick Companies. Raquel has served as an adjudicator at the National Trumpet Competition and International Trumpet Guild (ITG) Conference. Active in the ITG organization, Raquel is the Editor of the Trumpet Technology Column in the ITG Journal and serves on the Board of Directors. Raquel co-hosted the 2018 Trumpet Festival of the Southeast and the 2014 International Women’s Brass Conference. Page last updated February 13, 2019.